We are doing some maintenance and renovations starting this weekend! The hot tub will be down for maintenance and cleaning Monday March 5th and Tuesday March 6th. The main upstairs washroom, showers and wet sauna will be closed for renovations starting Friday, March 2, 2012. We anticipate that the work will be completed by March 16, 2012. During the renovations, the single washroom and shower near the office will be available as well as the downstairs washrooms. The dry sauna will also remain open. We apologize for the inconvenience and thank you for your patience. But it will be worth it! We don't normally post the status of amenities on this blog because maintenance issues happen too regularly. However, given the significant impact of these renovations, we thought it best to announce them more broadly. But remember that any planned status change (e.g. hot tub maintenance, road closures, etc...) are posted on our Twitter Feed. You can read it on your computer or receive it on almost any cellular phone as text messages. Nakations.ca is proud to announce that is has signed a contract with N Resort (an all inclusive, all au naturel resort) in Trelawny, Jamaica to provide the lowest rates in the Canadian marketplace. 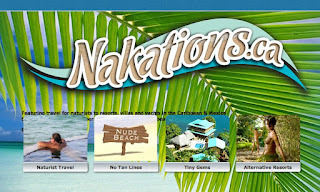 As part of this amazing association, Nakations.ca will be hosting, what we hope will become, an Annual JAMAICANADIAN Celebration at N Resort from May 5 – 12, 2012. During the week, guests will enjoy adventure and island tours, daily happy hour, beach and pool parties, theme parties and more ! Please contact us for more information.